If you thought that sparkling wine was only for ringing in the New Year, toasting newlyweds or christening yachts you should think again. Sparkling wine is great throughout the year for all sorts of occasions. Pop the cork on some bubbly and watch that magical sound bring a smile to anyone’s face. Not only do bubbles bring fun to the party they also bring great acidity that makes them an excellent pairing for all kinds of food. The sparklers are bursting on the scene in Lake Chelan like the jet stream of aromas and flavors carried on the millions of tiny bubbles bursting forth from a champagne flute. Lake Chelan has a thriving wine community that is growing in number of wineries and quality wines. With the dynamic collection of wineries, Chelan is becoming a destination that is about more than summertime fun in the sun. 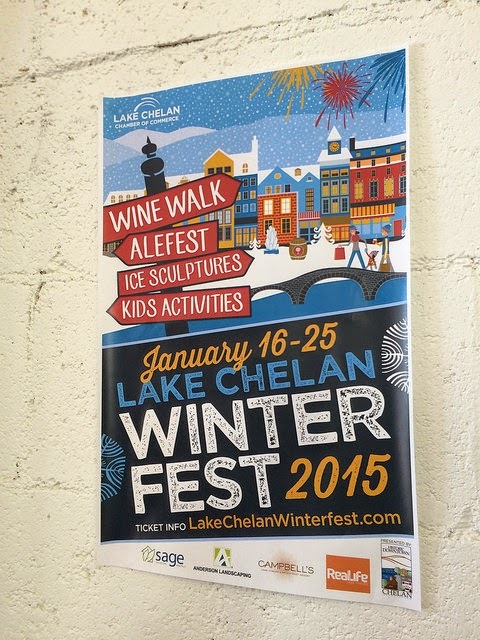 Each January Chelan celebrates the beginning of the year with their Winterfest. It is a fun way to kick off your new year and explore the wines of the Lake Chelan AVA. This year the organizers added a new event, the Bubble Bar. The Bubble Bar featured sparkling wines from four Lake Chelan wineries and amazing small bites from Erik and Adrianne of Canella Kitchen. Three of the winemakers are using grapes grown in the Lake Chelan AVA and there is good reason for that. The climate surrounding the lake is proving to be ideal for growing the grapes most commonly used to make sparkling wine – chardonnay and pinot noir. In fact, the microclimate created around the lake is proving to be one of the few locations in our state where pinot noir will grow happily. 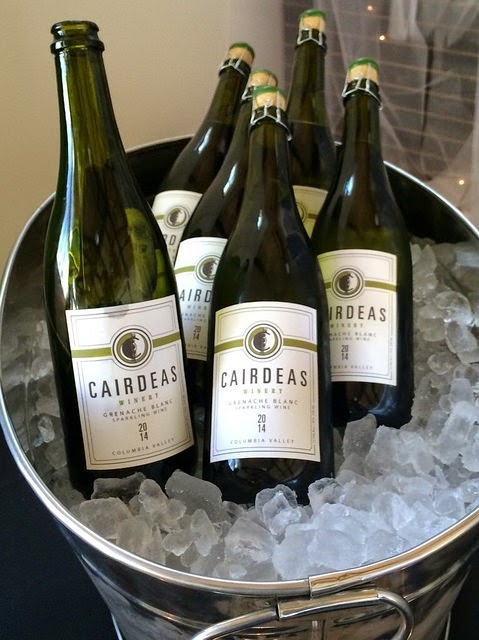 Cairdeas Sparkling Grenache Blanc is 100% Grenache Blanc from the Boushey Vineyard in Yakima. Charlie Lybecker, the wine maker, originally picked these grapes to use in his Southern White Rhone style wine. He was inspired by the floral aromas and acidity of the grapes to use them in his latest sparkling wine. Charlie makes his sparkling wine in the Italian style used to make Prosecco. The wine undergoes secondary fermentation in tank rather than in the bottle. The result is a crisp, light and delicious sparkling wine that really lets the character of the grape show through. The nose features notes of white flowers, light honeysuckle and citrusy lemon zest. The palate follows with lively bubbles featuring light crisp flavors of lemon and green apples. Karma Vineyards, Hard Row to Hoe and Tsillan Cellars all make their sparkling wines in the French method champenoise style. These sparkling wines all undergo secondary fermentation in bottle. The wine remains in contact with the lees until the bottle is disgorged to remove the yeast and cork the wine for consumption. The additional time the wine spends in contact with the yeast cells results in the yeasty bread characteristics found in Champagne and sparkling wine made in the champenoise style. 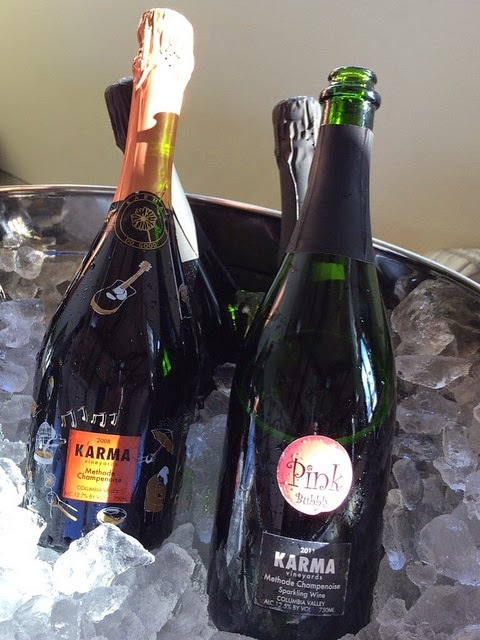 Karma Vineyards specializes in sparkling wines (you can read an earlier profile here on the Wine Anthem). They offered two choices for the Bubble Bar. The 2011 Pink made from 80% Pinot Noir and 20% Chardonnay and 2008 Brut de Brut. My favorite was the 2008 Brut de Brut made with 60% Chardonnay and 40% Pinot Noir (60/40). This sparkling wine had beautiful notes of yeast, pears, green apple and a hint of lemon zest. Tsillan Cellars provided their 2013 Sparkling Brut Pinot Gris made from grapes grown in their estate vineyard on the South shore of Lake Chelan. This sparkler had notes of pear, yeast and green apples. It paired very nicely with the bite sized smoked salmon quiche from Canella Kitchen. Hard Row to Hoe produces their Good in Bed Sparkling wine from Pinot Noir grown at the Clos Cheval vineyard on the South side of Lake Chelan. Judy Phelps, Hard Row’s wine maker, picks the grapes in mid-September with the intent to make her sparkling wine. Picking the grapes early results in higher acidity that you typically find in sparkling wines. The grapes are whole cluster pressed which results in a beautiful sparkling wine that is slightly salmon colored. The nose shows notes of yeasty pear followed by a palate that features lively tight bubbles bursting with green apple, pear and lemon zest. Good in Bed paired well with the sweet and savory Pear and Blue Cheese tartlets. Lake Chelan is becoming a year round destination for fun, especially if you are a wine lover or explorer. Many of the wineries are open through the winter. If you are looking for adventure you should head on out to Chelan to explore the burgeoning wine scene. Most of the winemakers work in their tasting rooms. That provides the perfect opportunity to learn about these fabulous wines from some of the friendliest people in the Washington wine industry! Thanks Marty Sparkling for the review on the 'sparkling scene' at Lake Chelan. Fun times and great wine Chelan-Manson wineries for sure.